Queen Cryptic white-tailed bumblebee (Bombus cryptarum). Photo credit: Steven Falk. One of the cryptic species within the White-tailed (Bombus lucorum) complex, this species appears to have a largely northern and western distribution. Bombus magnus has a yellow collar at the front of the thorax and another yellow band in the middle of the abdomen, with a pure white tail. Cryptic white-tailed bumblebees. Photo credits: Gordon Mackie (left), Peter Barber (right). The White-tailed complex includes three species: the true White-tailed bumblebee (Bombus lucorum), Cryptic bumblebee (Bombus cryptarum) and Northern white-tailed bumblebee (Bombus magnus), which are only reliably distinguished as queens (and potentially only by DNA testing). 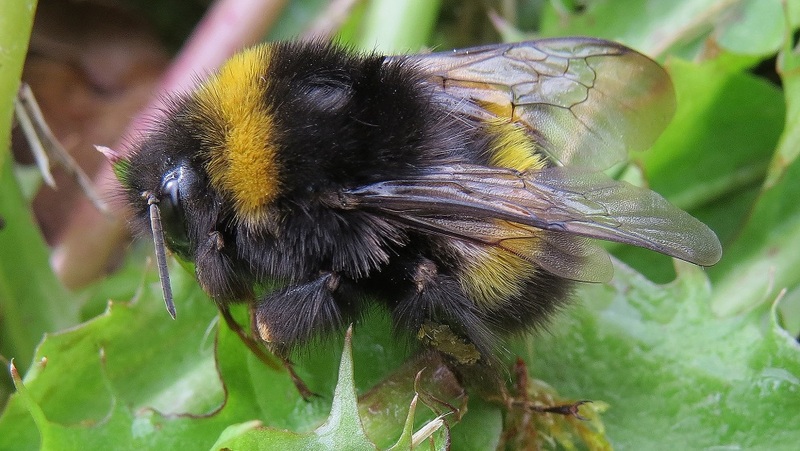 Records so far indicate that the cryptic species are most abundant in the north and west, with the true White-tailed bumblebee widespread throughout lowland Britain, but the difficulties of identification mean this may not be the full story. Queens of the Northern white-tailed bumblebee have the collar extended significantly further down the sides of the thorax than do the White-tailed bumblebee, and queens of the Cryptic bumblebee have an s-shaped black mark through the yellow of the collar in front of the wing bases, although the legitimacy of this has been questioned and more research is required. Workers are also practically indistinguishable from Buff-tailed bumblebees (Bombus terrestris) although Buff-tailed bumblebees sometimes show yellow hairs in the tail, unlike the White-tailed bumblebee, therefore it is safest to record these as terrestris/lucorum.